It is only our second year but readers' participation has been absolutely thrilling and vital to the process. Close to a 100 nominations were received from five continents, many supported by very thoughtful reasoning and information. It made selecting The Chic Sikhs of 2009 all the more difficult. Saran Singh & The Sikh Review. We welcome them wholeheartedly to the pantheon of Chic Sikhs of the Year. I personally have a bias for institutions rather than for individuals, no matter their charisma, intelligence or worldly success. I prefer to celebrate institutional formation and institutional success because they outlive the individuals, their egos or their persona. Institutions become a permanent presence in our lives and the lives of those yet to come. These three honorees most assertively represent Sikh realities today and they have had a major role in shaping these realities. Their work is a clear illustration of the process of institutionalization and how it occurs. The activities and bailiwick of the three appear separate and distinct but are, in fact inter-related. These three Sikhs speak to 1) our image worldwide, 2) our need of education in who we are and why we are the way we are, and 3) justice that is a corner stone of Sikhi. 1984 was a watershed for Sikhs. The trauma of Operation Bluestar and the Government sponsored pogrom that followed, left a permanent impress on Sikh psyche. 1984 altered and redefined the dynamics of Sikh relationship not only with the political entity that is India, but also Indian society at large. A quarter of a century later, the events of 1984 remain unresolved. The crimes committed against the Sikhs were horrendous enough. They become infinitely worse when seen in the light of government collusion, if not active participation, and the miscarriage of justice. A string of Government appointed Inquiry Commissions only served to rub salt into the wounds of the Sikhs. The guilty remain free. Justice has remained both illusive and elusive for over 25 years. Preceding such crimes was a whole cultural history of demeaning and diminishing the Sikhs. Sikhs have not given up their demand for justice. Today, we can glimpse an iota of change, a small shift in prevailing attitudes in India that gives us renewed hope. We owe this glimmer of optimism in large part to the steadfast and unwavering dedication of Sikhs like Advocate Harvinder Singh Phoolka. As a young lawyer starting out in Delhi 1984, S. Harvinder Singh found himself squarely in the middle of mayhem on that fateful day in November. He had to whisk his pregnant wife on a motorcycle, skirting the main roads to get home. He was tempted to retreat to the safety of Chandigarh, but the plight of widowed, orphaned or homeless Sikhs, moved him to action. Advocate Phoolka launched the Citizens for Justice Committee in 1984 and has, for 25 years, single-handedly led the legal battle for the victims of 1984. In the true spirit of the Sikh practice of tithing, this work has been done gratis - with no charge to the victims he represents. While 25 years may have put his career on hold and aged him, the years have not slowed his relentless intensity in the pursuit of justice. As the co-author of the much acclaimed 'When a Tree Shook Delhi', he continues to be a major force in documenting human rights abuses. If India is to live to its label as the largest democratic nation in the world, it owes a debt to activists like Harvinder Singh Phoolka, Ram Narayan Kumar, Inderjit Singh Jaijee and Jaskaran Kaur Grewal, among others, for institutionalizing the voice for freedom, justice and equal rights. I would be remiss if I didn't acknowledge an Honorable Mention for the journalist, S. Jarnail Singh - now known world-wide as 'The Lion of Delhi'. His single act of throwing a shoe at the Indian Home Minister dramatized, as nothing else, the denial of justice for Sikhs in India. His gesture has found overpowering resonance with Sikhs and non-Sikhs both in India and abroad. We celebrate Harvinder Singh Phoolka. We have great expectations of him. The first Sikh Prime Minister of India, Manmohan Singh was initially dismissed by astute observers as an academic and an amateur, unaccustomed to the rough and tumble of politics. He was seen, not without reason, as a puppet to his political masters. The first Indian Prime Minister to be elected to successive terms since Nehru, Manmohan Singh has defied the skeptics and displayed a political acuity that even his detractors have to concede. This Sardar strides the international stage as a colossus - highly respected economist and the leader of a growing economic and military power. For Sikhs worldwide, his presence and global visibility has had an electrifying effect. Manmohan Singh's image as a man of impeccable integrity, a technocrat and economist who can be tough as nails and yet genuinely humble has defined the new Sikh stereotype. The atmosphere in India has noticeably shifted from being overtly anti-Sikh, whether in Bollywood, in government and civil service or in the social milieu, to a reality that is turning both friendly and respectful as it ought to be. As an economist with a distinguished background in academia and international institutions, Manmohan Singh's handling of the Indian economy during the recent crisis has been exemplary. In spite of the financial meltdown that has put on the mat bigger and better economic powers, Manmohan Singh has steered India on a path of disciplined progress towards world status. He has lived the label of a very intelligent, extremely competent man of integrity in the complex world of Indian politics. government, the community feels that the injustice of 1984 should not remain hanging. His recent statements, including an apology to the Sikhs, were positive but not strong or clear enough. On matters that affect Sikhs worldwide his record before and after assuming the office has not always been forcefully clear. But India's political realities are complex. This Gordian knot is not easily cut. And we are a minuscule minority in India as we are in the rest of the world. We celebrate Manmohan Singh for his vision and for his presence on the world stage which has transformed the Sikh image, and for what more it can deliver. 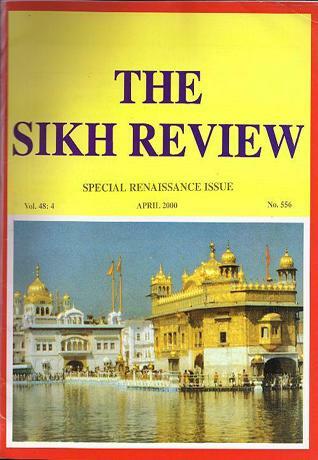 "The Sikh Review" dating from 1952 is the oldest continuously running Sikh monthly publication in English in the world. 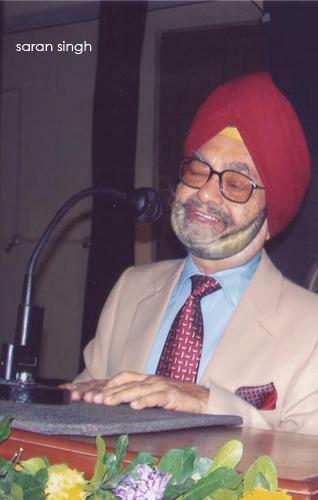 S. Saran Singh assumed Editorial responsibilities in 1983 on retiring from the Indian Administrative Service (IAS), and in 1985 became Editor when the Founder-Editor Bhag Singh relinquished his charge. Saran Singh has steered "The Sikh Review" through good times and bad with rare aplomb - particularly in the post-1984 years, which have been difficult. When Saran Singh took charge in the 1980's, "The Sikh Review" was in disarray, with an inadequate budget and no staff. He brought his keen administrative skills to give the magazine a professional presence and an organized administrative direction. "The Sikh Review" is now an international forum for scholarly and lay conversation on all matters pertaining to the wider world of Sikhi.It reaches the farthest corners of the planet. Working with this scholarly and thoughtful man has been a fantastic learning experience. "The Sikh Review" produces special issues on matters that engage the Sikh World. The events of 1984, Gurpurubs and Vaisakhi find coverage. Controversies, too, get their space, such as matters pertaining to the historian Hew McLeod and his writings or esoteric aspects of Dasam Granth. History, culture, exegesis of gurbani, poetry, discussion and disagreement - all find space in this monthly. "The Sikh Review" is an important voice highlighting issues of Sikhs and Sikhism in the Diaspora. It now has many more young correspondents. Saran Singh has been an outspoken and fearless critic of the Indian government on matters pertaining to Sikhs. He wrote the Guest Editorial for The Sikh Review's July 1984 issue, criticizing Indira Gandhi - whom he knew, and had worked with, personally - for Operation Bluestar. The issue of the journal was promptly banned in Punjab, including its capital, Chandigarh, by the government. Saran Singh also addressed a massive gathering of Sikhs at the Madison Square Garden in New York to protest the Indian Army attack on the Golden Temple. He returned to India to discover that the government was contemplating forfeiting his pension. "The Sikh Review" knits together the worldwide Sikh community. It makes and records history every day and its archival material is a first class resource. We celebrate Saran Singh and "The Sikh Review" for giving Sikhs an effective voice worldwide. It brings us all together - young and old, wherever we live -- who feel the pull of the message of Sikhi. The Sikh Review has come a long way with Saran Singh and has a longer way to go. Gurumustuk Singh Khalsa, Espanola, New Mexico, U.S.A.
Manu Kaur Saluja, New York, U.S.A.
Sikh Research Institute, Texas, U.S.A.
I.J. Singh, New York, U.S.A.
1: Sohan Singh (Canada), December 31, 2009, 11:19 PM. 2: Karam Singh (New Delhi, India), January 01, 2010, 8:42 AM. I like your choices ... indeed, they represent three important aspects of high Sikh contribution during 2009. But I particularly laud your choice of Manmohan Singh. The Sunday Times recently opined that he may soon come to be known around the world as "the great politician of our age"! Deservedly! 3: Dildeep Singh Dhillon (Canada), January 01, 2010, 6:56 PM. Politicians cutting across party lines and ideology have all used the '84 riots for their own greed, self interest and promotion. Not one of them has sincerely helped the victims of these horrific events, 25 years on. Harvinder Singh Phoolka has tenaciously pursued justice for these poor souls. In helping the poor and defending the rights of the weak, he has followed the principles of Sikhism. In pursuing justice, and in going after the criminals and not their religion, Harvinder Singh has furthered Guru Nanak's message of peace and communal harmony. By following non-violent means and using his intellect, he has been a positive role model to Sikhs and the world at large. By educating, debating, informing, sharing and never letting go of his pursuit for justice, he has kept the issue alive to the best of his ability. Harvinder Singh Phoolka is a brave person and a true hero for all this and much more. I salute him and wish him Chahdi Kalaa in all his endeavours. 4: Gurjender Singh (Maryland, U.S.A.), January 01, 2010, 8:57 PM. I salute Harvinder Singh Phoolka, who was very young in 1984. When he saw the happenings of 1984 in Delhi, he stayed on in Delhi to help the 1984 victims. This is a big sacrifice. On the other hand, there are a lot of Sikh 'leaders' who walked away from helping the victims. God Bless him. 5: Jodh Singh, Arora (Jericho, New York, U.S.A.), January 02, 2010, 10:19 AM. This was the most appropriate choice and I whole heartedly support it. I had known two of the three gentlemen personally; and I have read about the hard work of H.S. Phoolka for the victims of 1984. Sardar Manmohan Singh has done the best service for India's progress than anybody before him. He is an honest man, a great economist, a loyal patriot and a good Sikh. S. Saran Singh is a great administrator and he has done phenomenal service to Sikhism and has improved The Sikh Review. I wish all Sikhs would subscribe to it. 6: Deesh Kaur (Canada), January 02, 2010, 11:28 AM. Congratulations to Sardar Phoolka! May Waheguru bless him and his family. 7: Sara Singh (U.S.A.), January 02, 2010, 1:26 PM. Sardar Phoolka has inspired me to be a good Sikh ... to show courage in the face of adversity, to help those less fortunate than myself and to stand tall and proud of my heritage! He has renewed my faith in our community ... we will look after our own and leave no one behind! He is the only one of the three who is without any controversy or political alliance. He stands for humanity! 8: Dr. Birinder Singh Ahluwalia (Toronto, Ontario, Canada), January 02, 2010, 7:20 PM. Congratulations to the three Chic Sikhs of 2009. This is a well-deserved honour for each of them for "who they are" and "what they have accomplished in their lifetime". Each is an inspiration to us all - in the present generation and for generations to come. 9: Balwinder Kaur (Ireland), January 03, 2010, 12:55 AM. Can we nominate Harvinder Singh Phoolka for the Nobel Peace Prize or any other international award for helping others? He has stood up for the 'little' person that all the others have forgotten? He has lived up to the true spirit of Sikhi! 10: Ram Phal Dwivedi (Kurukshetra, India), January 08, 2010, 9:47 AM. We should be proud that a person like Dr. Manmohan Singh is our Prime Minister at the time of recession in the world's Economy. India got an economic and moral boost up during his tenure. I think he has taken India to new heights. Due to his efforts, India has got recognition in the world. May God bless him. 11: Jaswant Kaur (U.K.), January 09, 2010, 8:34 AM. Ram Phal, perhaps you and other good Indians like you can repay the debt that you owe Dr. Manmohan Singh by educating yourself (and by that I don't mean the Indian media) on the Nov 1984 pogroms and subsequent disappearances of innocents in the Punjab between 1984-1995 and speaking up for justice. May be that is how we can truly help humanity and take India to new heights! 12: Suirnder Kaur (Ireland), January 14, 2010, 12:35 AM. 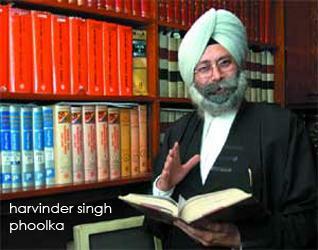 God bless Sardar Harvinder Singh Phoolka ... we, the Sikhs, salute you! 13: Karen Kaur (Kenya, Africa), January 14, 2010, 8:11 PM. When I first started to look into the events around the November 1984 pogroms, I was overwhelmed by the atrocities that had occurred and had a hard time dealing with the subsequent disappearances of innocent Sikhs in the Punjab as part of the India government's so-called "counter-insurgency" programme. I had vaguely heard about these things from my parents over the years but didn't really pay much attention to either event. However almost as if the time was right these events landed in my psyche with a big bang. But I was feeling hopeless and depressed, and wondering what I would have done if I had had to live in similar circumstances. Then I started to hear about a fellow called S. Harvinder Singh Phoolka. I learned how he had taken up the cases of the widows in Delhi; I read how his life had been threatened as he sought to persecute those involved; and I watched his interview with Jagdish Tytler on You Tube. I began to draw strength from watching Mr. Phoolka confront this monster, and understanding that those who had fought back had survived. I learned about the strength of my people, their courage and what sets them apart ... and Mr. Phoolka became my hero. For that I am grateful! Despite the fact that justice has not been granted to the victims, Mr. Phoolka has not given up ... he has succeeded in keeping the issue alive and making sure these people are not forgotten. For this I can only say: Thank You, Mr. Phoolka! May God bless you and keep you well. 14: Natalee Singh (Vancouver, British Columbia, Canada), January 21, 2010, 1:52 PM. Mr. Phoolka is a true, modern-day hero. I wish I get to meet him ... and also Lt. Gen. Romeo Dallaire (Canada) ... in my lifetime! 15: Darshan Singh (Mumbai, India), January 27, 2010, 7:51 AM. All the three recipients of The Chic Sikh of 2009 Award have, each in his own way, done wonderful work for the less fortunate who suffered during 1984. This act of violence was not expected but it took place because of politically motivated individuals who are roaming free even after 25 years. Justice DELAYED is justice DENIED ... that is what has happenened in the case of Sikhs. I offer my felicitations to the great souls and pray God may bless them with a long life. Comment on "Presenting: The Chic Sikhs of 2009 "